The problem with this isn’t that better bus service is a bad idea. Upgraded buses, upgraded bus stops, traffic signal priority, high-tech innovations such as “next bus” passenger information systems at bus stops and onboard wi-fi, and other improvements, are all important ways to attract more ridership to public transport. But the problem is that a collection of “BRT” promoters — from the motor bus industry to highway enthusiasts to some self-proclaimed transit supporters, have been claiming that, somehow, “BRT” has all the advantages of urban rail at much lower cost. And that’s just plain wrong. It’s false, and in many, perhaps most, cases, it’s deceptive. In effect, it’s a kind of snake oil being peddled in the field of urban transit. An awful lot of cities and transit systems worldwide that have been vigorously installing new LRT systems (including streetcars) haven’t been ignorant or oblivious to the “BRT” option. Instead, they’ve reviewed and analyzed the pros and cons of this and other alternatives, and concluded that, for their own needs, LRT — and other forms of urban rail — is the best choice. Let’s briefly consider a few of the most familiar claims that “BRT” proponents try to promulgate. ► “BRT” is truly “rapid transit” — Mostly nonsense. The “BRT” promotion campaign typically presents images of buses on special exclusive guideways (the so-called “Gold Standard” of BRT) to seduce public support (mainly from local civic leaders). But the reality of most purported “BRT” systems is … buses running mostly in mixed traffic like “regular” buses, but perhaps in limited-stop modes, with somewhat fancier stations … but a far cry from fully grade-separated rapid transit. 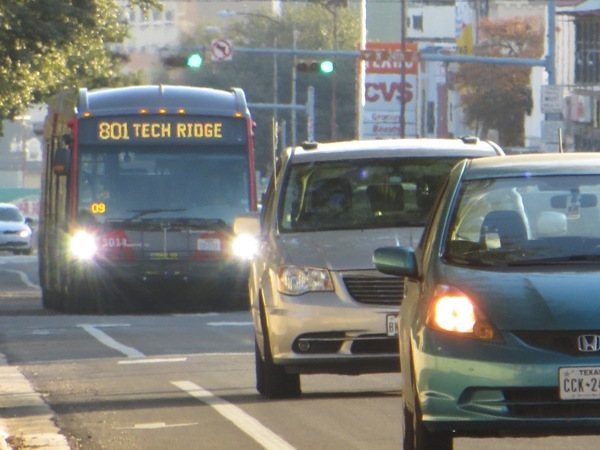 This has become an issue in Austin, Texas with perhaps the most recently opened so-called “BRT” system (funded as “BRT” under the federal Small Starts program). 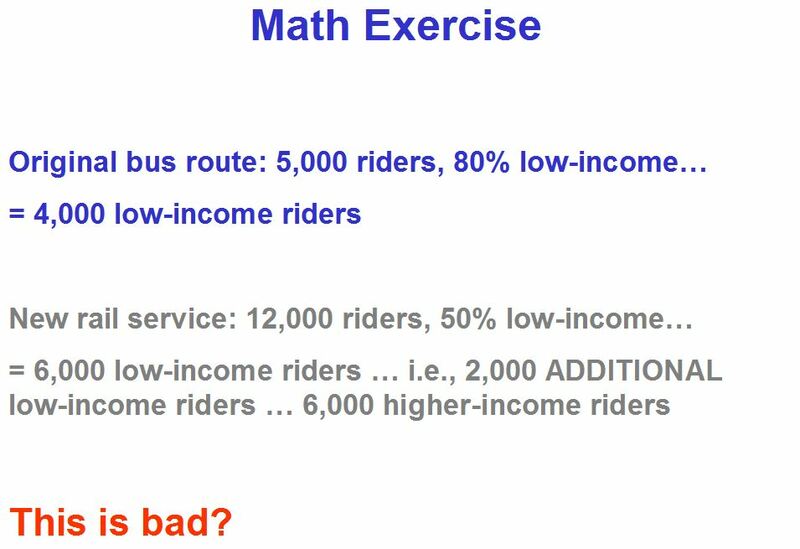 Called MetroRapid, the system is being widely ridiculed in the community for attracting daily ridership of only 6,000 and resulting in a net ridership loss of 11% in the corridor it serves. 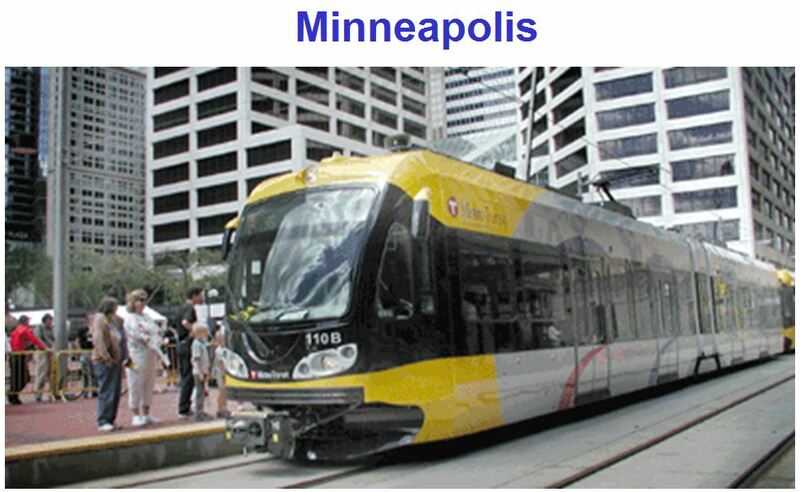 See: Why MetroRapid bus service is NOT “bus rapid transit”. Austin’s MetroRapid “BRT” systems runs in mixed traffic, and has become the object of local ridicule. Photo: L. Henry. ► “BRT” is a lot cheaper than LRT — Well maybe, maybe not. When total lifecycle costs, expressed as annualized capital costs, plus operating and maintenance (O&M) costs are considered, LRT is often the more cost-effective investment, particularly through the essential metric of cost per passenger-mile. 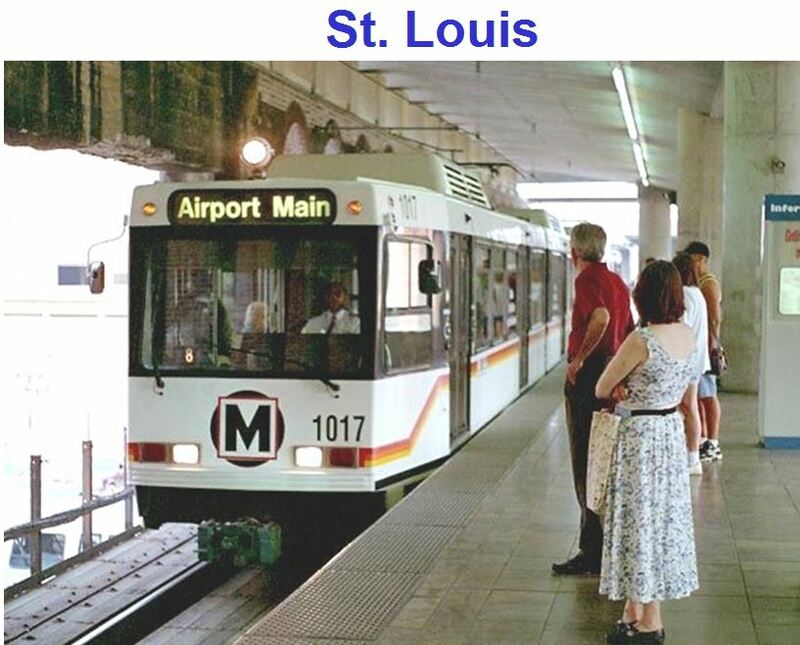 • “Free” buses vs. “expensive” rail? 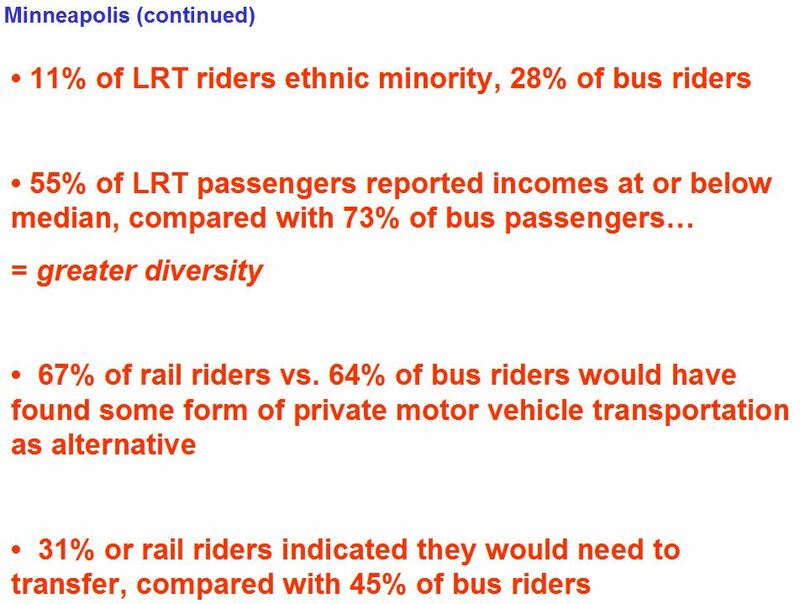 ► “BRT” has the capacity of LRT — Definitely not in terms of ultimate potential capacity. 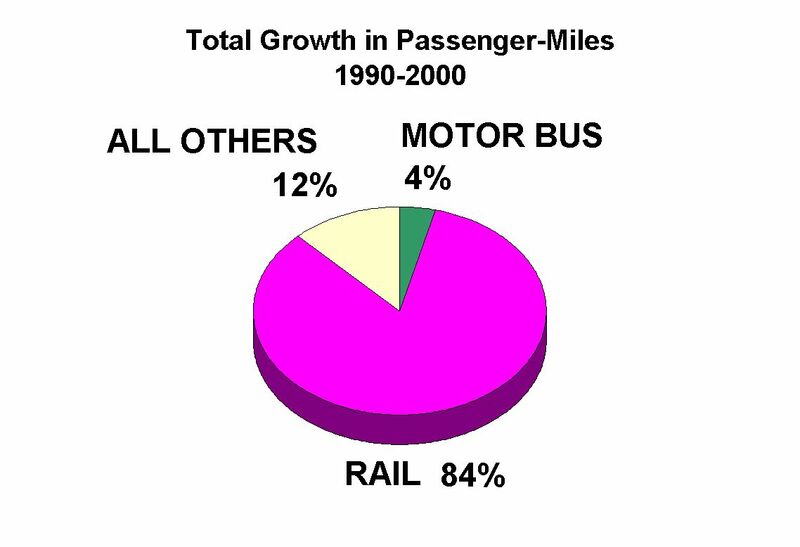 As “BRT” systems attempt to cope with increasing ridership (which may happen not because “BRT” systems are so attractive, but because of rising population and the increasing costs and congestion of private motor vehicle systems), the number of buses required to try to provide capacity starts to overwhelm road systems and station passenger-handling capacity. 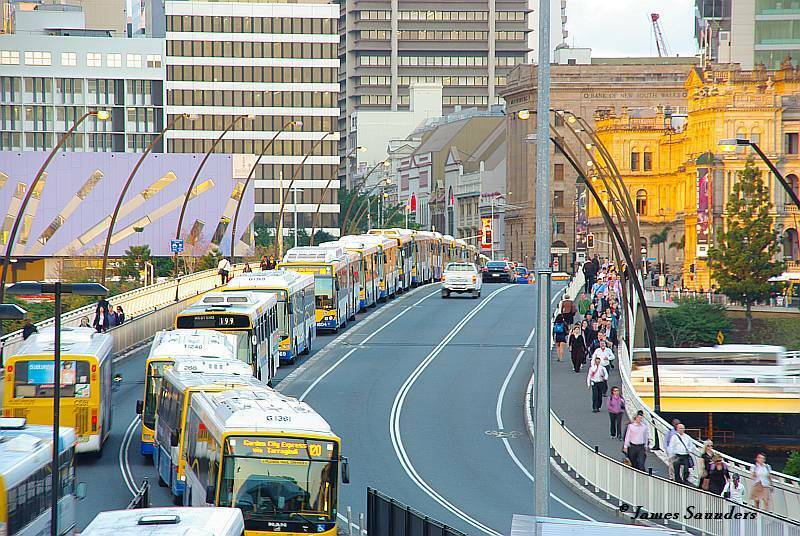 Massive bus traffic jam in Brisbane, Australia illustrate problem of fitting “BRT” into a high-capacity application. Photo: James Saunders. 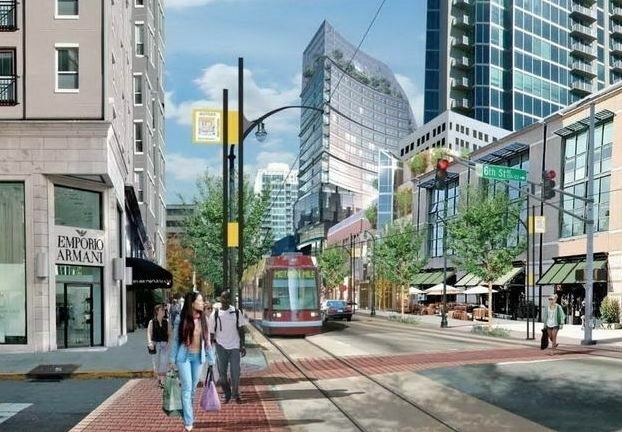 ► “BRT” attracts development, just like LRT — False. 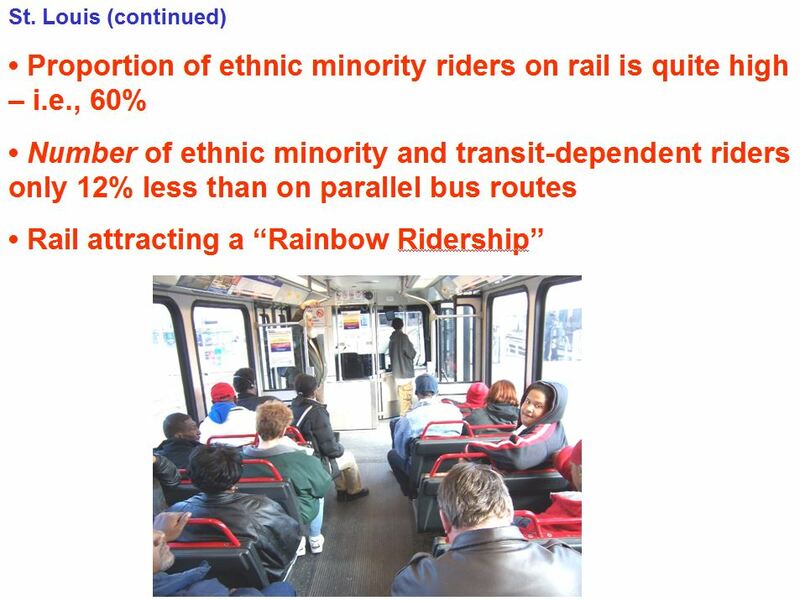 This claim by “BRT” advocates is based predominantly on cases in Pittsburgh and Cleveland, In both cities, the real estate development attributed to “BRT” was overwhelmingly attracted by rail transit systems, both existing and planned. 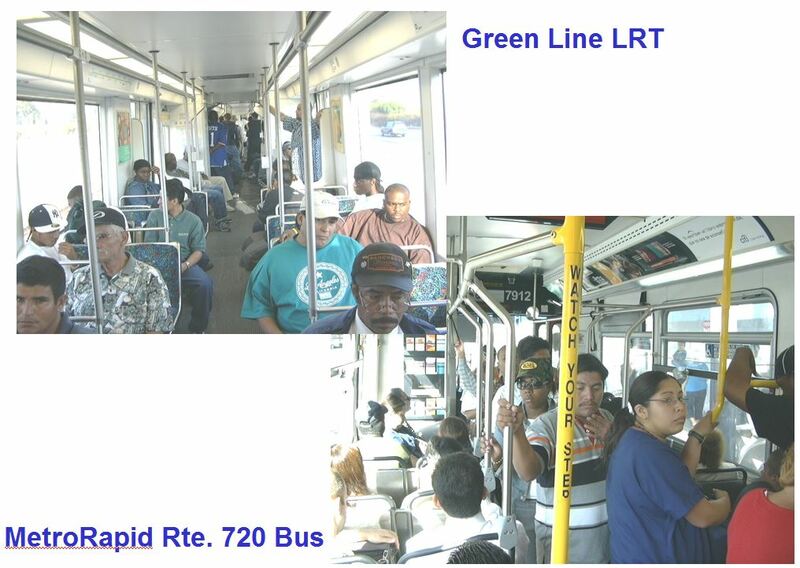 Phoenix light rail transit (LRT, left); Los Angeles Orange Line “bus rapid transit” (BRT, right). Photos: L. Henry. Losing a rail transit ballot measure doesn’t have to mean the end of a community’s hopes and dreams for urban rail, according to a recent study by the Light Rail Now Project. What it takes, though, is the will to hang in there, respond to reasonable public concerns, tweak the rail plan as needed, and submit it for another vote. This actually doesn’t happen often. In some cases, the urban rail possibility just evaporates because local decisionmakers and planners just throw in the cards and move on to other, less ambitious transit proposals. However, the Light Rail Now study examined the six cases since 2000 where a rail transit vote initially failed, but the local transit agency or civic leadership kept their eyes on the prize, continued to recognize the benefits of rail transit, and resubmitted a proposal in a ballot measure that succeeded in getting voters’ endorsement. This has happened in Austin (Texas), Kansas City, Cincinnati, Tucson, Seattle, and St. Louis. The time delay between the initially failed vote and the ultimately successful re-vote was a particular focus of the study. 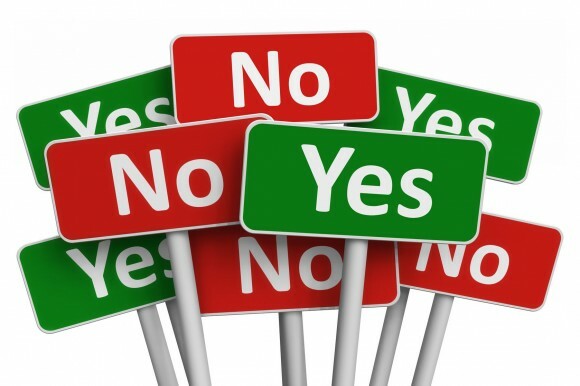 So, how much of a time gap was found between rejections and approvals? Left bar: Average years of delay in cities already operating rail transit. 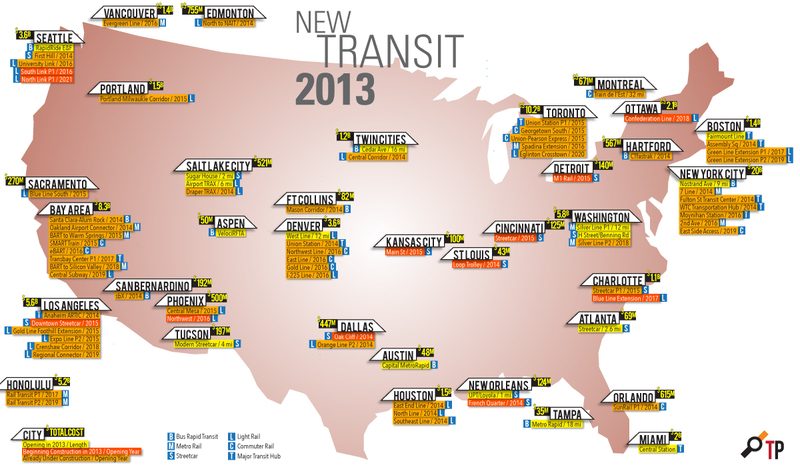 Right bar: Average delay in cities with no current rail transit. Graph: Light Rail Now. 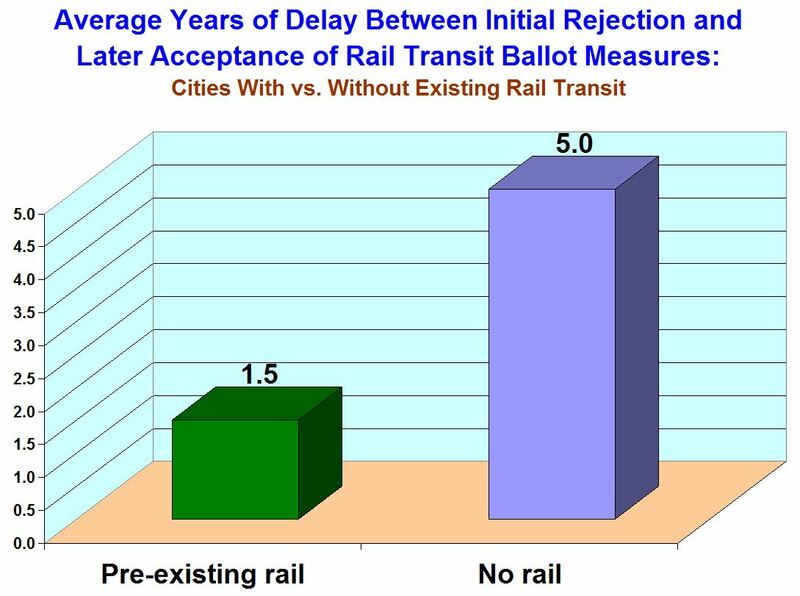 The process of re-submitting a rail transit measure to a vote may depend not so much on public attitudes but on the determination of sponsoring officials, their responsiveness to public input, and their willingness to re-craft specific project details to more closely conform to public needs and desires. Cincinnati: Simulation of streetcar running downtown. Graphic: City of Cincinnati. This commentary has been adapted from a December 19th statement by the author to supporters of the campaign to continue Cincinnati’s streetcar project, immediately after the favorable vote by the City Council. With the City Council’s vote on December 19th to resume Cincinnati’s streetcar project, our city confirmed its will to continue along the path to a balanced transportation system. Our path has been up and down with lots of twists and turns and leaps of faith that took us to unknown places. But we soldiered-on, and now the path is wider, flatter, and clearly marked for others to follow, not only in Cincinnati but in other cities that want to gain more citizens and become more competitive. There are so many people to thank, but first and foremost, I want to thank former Mayor Mark Mallory, Vice Mayor Roxanne Qualls, and City Manager Milton Dohoney. Even though we reached our goal on December 19th, we wouldn’t have even been in the game were it not for their leadership of the Cincinnati Streetcar over many years. Their support cost them dearly, and we should be forever grateful. And to our long-time champions on City Council — Chris Seelbach, Yvette Simpson and Wendell Young whose eloquence and persistence following the election, working with PG Sittenfeld, brought their colleagues, Vice Mayor David Mann and Councilmember Kevin Flynn, along to enable us to continue along our path. Immediately after the December 19th vote, Mayor John Cranley was very gracious in offering his congratulations to me and to others. I hope this period of divisiveness now passes and that we can all join with him and Christopher Smitherman, Charlie Winburn, and Amy Murray to foster the city we all want to have. Were it not for Ryan Messer, who parachuted-in to lead this effort in early November, we would not have succeeded. The kind of leader who emerges every ten years or so here, he brought new energy to our movement. Early-on, he recruited our attorney, Paul DeMarco, who used his contacts at the highest level of our nation’s government to bring about the results we achieved, to assure the Feds we knew where we were going. Early-on, without a hint of hesitation, Karen Blatt volunteered our spiffy campaign office, and Ryan hired Scott Allison to execute the flawless campaign to gather signatures. Others including Jean-Francois Flechet, Sean Lee, Rob Richardson, Jr, Margy Waller and Brad and Karen Hughes did whatever had to be done and were the wisest advisors and best team-players anyone could have. There are so many others that contributed so much to this effort that I cannot mention them all but they are all strongly appreciated. Suffice it to say that this effort could not have been sustained over all these years without all the people who have been involved. Eric Avner of the Haile Foundation raised $9,000,000 in a little over 48 hours, enough to make City Council comfortable that the cost of operating the streetcar was assured for the first ten years. This was the keystone of the plan to save the streetcar. There were many memorable moments in this campaign. One I’ll never forget was the December 10th meeting at First Lutheran Church near 12th and Race, where 450 people showed up to sign-out their petitions. Chris Heckman and Kristen Myers are members of the congregation, and they quickly arranged for the church to open its doors twice to us. I’m certain this set the tone for the whole campaign. John Schneider, Cincinnati’s “Mr. Streetcar”. Photo: Cincinnati.com. Speaking of the campaign, we now have 11,000 Cincinnatians’ names and addresses for our efforts going forward. The planning and execution of the signature-gathering was orchestrated with great precision by The Strategy Group and its able leader, Ian James, who made a critical judgment that the number and intensity of our volunteers was more than adequate to gather the signatures. We wouldn’t need paid signature-gatherers. 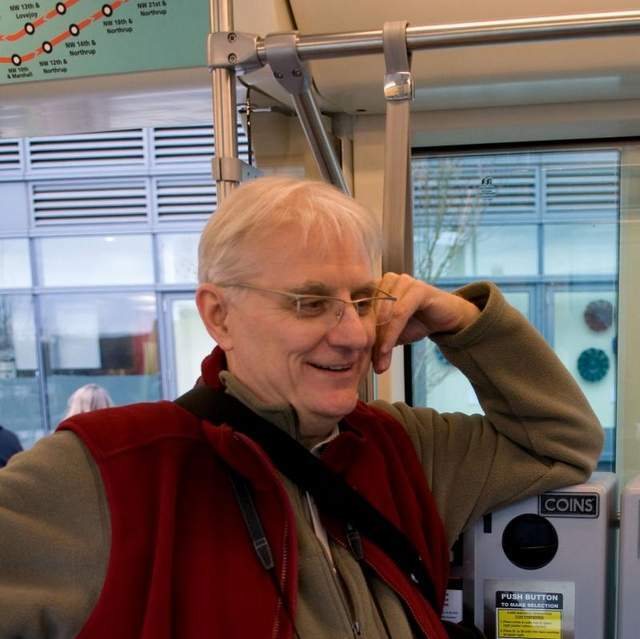 Plus, it gave us all an opportunity to tell the streetcar’s story in the way we know it. And by the way, we registered a bunch of streetcar supporters to vote in the process. Our thanks go well beyond Cincinnati to the many people in many cities who have been watching our project intently, including especially Portland’s mayor, Charlie Hales and his wife Nancy, who have joined us on many of our trips there over the years. When he was in the private sector, Charlie helped plan the Cincinnati Streetcar, and he has been a guiding light for me. We’re not finished with the Portland trips. They have an early spring there. Most of all, we should all thank our spouses, families, employers and co-workers for tolerating our absences over the past days and nights. They were soldiers in this too. I hope that in this new year everyone will continue to work harder than ever to bring more diverse transportation choices to our city, Cincinnati, or to whatever city where you live. Tucson streetcar leaves center-street station during testing. Photo: Tyler Baker, Arizona Daily Wildcat. 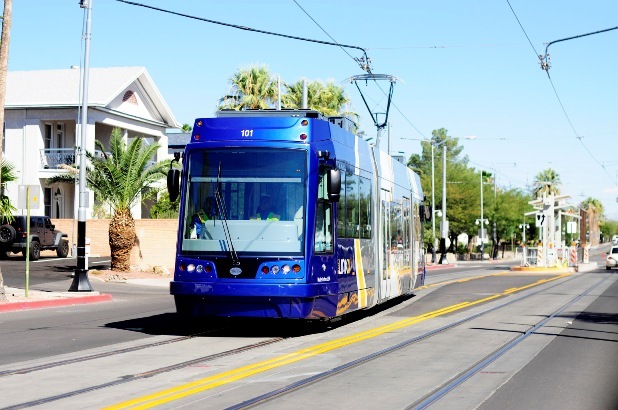 Tucson, Arizona — It’s still many months away, but public anticipation of the opening of Tucson’s brand-new streetcar system has been building. And it’s getting a huge boost from the local Friends of the Streetcar group. In collaboration with merchants at Main Gate Square outside the main entrance to the University of Arizona, the pro-streetcar group is sponsoring Streetcar Celebration: Destination Main Gate Square, a special celebration on January 15th, one of several shindigs the organization has been initiating to raise awareness and feed anticipation for the new service. 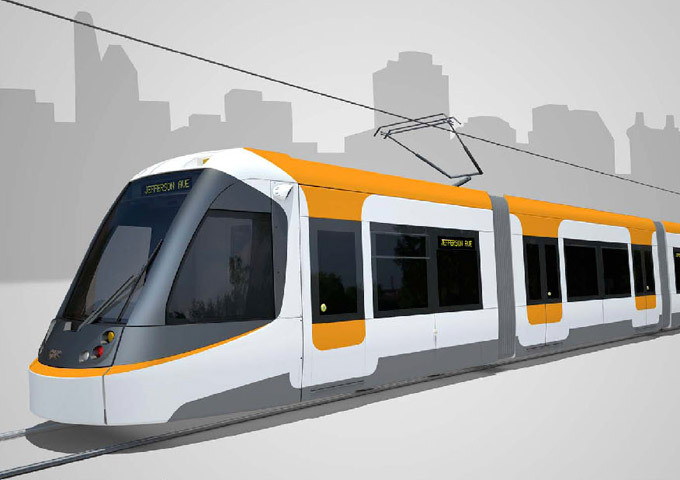 The 3.9-mile, $196 million modern streetcar line is due to open in mid-2014 after rolling stock supplier United Streetcar delivers all eight streetcars on order. The upcoming festivities, scheduled on a Wednesday afternoon between 4:00 and 7:00 pm, will include performances by musical groups, a street performance group called Cirque Roots (featuring stilt walkers, hoop dancers, and acrobats), “fun with 2-EEE the Clown Face Painting and Balloons, a free photo booth by Bumblebee Photobooth with souvenir photos and more”, according to a report in The Explorer, a local publication. The Arizona State Museum will be open until 7:00 pm allowing free admission, and a number of restaurants, cafes, and various retailers are offering substantial discounts. With opening of the new urban rail system scheduled for much later in the year, these events in Tucson by local rail supporters may provide an example of how to build public enthusiasm for the service — and hopefully pay off in higher ridership when the trains actually start rolling. 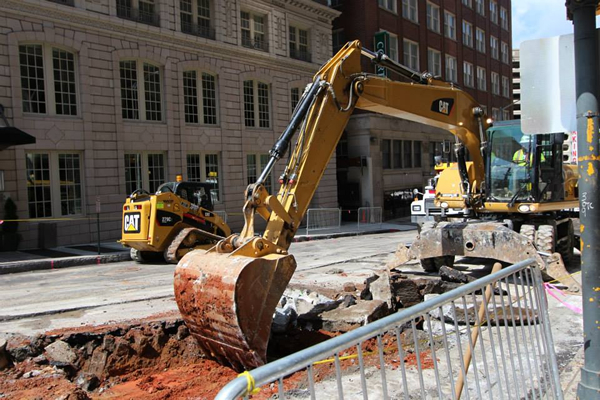 Cincinnati streetcar on order from builder CAF. Simulation: City of Cincinnati. 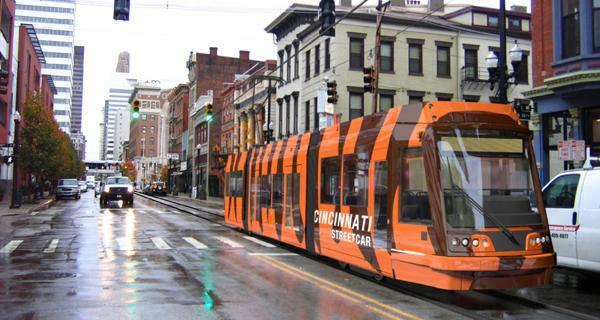 For supporters of urban rail, it’s been a clenched-teeth political action movie in Cincinnati, as newly elected Mayor John Cranley tried to implement his campaign promise to pull the plug on the city’s streetcar project — even though construction was well under way, tracks had already been laid in the street, and the Federal Transit Administration (FTA) was threatening to demand repayment of of millions of dollars in grants if the project were cancelled. Besides the new mayor, the election of three new councilmembers meant a council majority against the rail project, and on December 4th, the council voted to “pause” further work pending an independent audit by consulting firm KPMG. In response, the FTA issued an ultimatum: Resume the project by Dec. 19th, or forfeit the federal grant and pay back funds already transferred. Meanwhile, the prospect of scuttling an ongoing project and wasting funds already invested sparked a local grassroots rebellion involving not just rail project supporters but a wider spectrum of Cincinnatians. A powerful mobilization for a referendum on a city charter change to require completion of the rail project collected roughly twice the number of signatures required — also attracting national media attention. This show of force seems to have helped in starting to move councilmembers’ leanings. 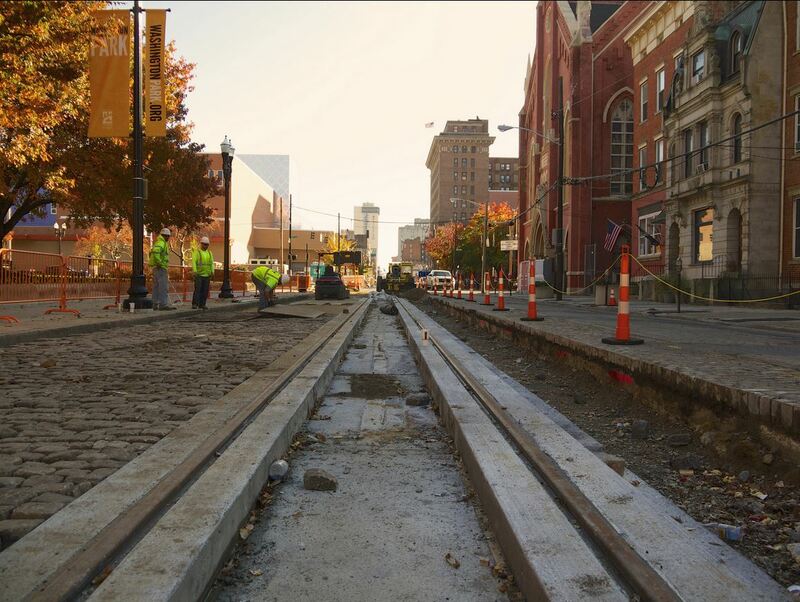 Recently laid Cincinnati streetcar trackage in Elm St. on Nov. 8th. Original granite pavers are being reinstalled to restore historic appearance. Photo: Travis Estell (Flickr). On the brink of the Dec. 19th deadline, the project was also reprieved by a written commitment, honchoed by the Haile U.S. Bank Foundation and involving roughly 15 private-sector backers, to cover as much as $9 million of the line’s operating costs over its first decade, if necessary. On Dec. 19th, just hours from the FTA deadline, the Cincinnati city council voted 6-3 to resume the project. “We’re going to have a streetcar” Mayor Cranley announced at an afternoon news conference with new Councilman Kevin Flynn, who had spent days helping forge the private financing agreement. It represented an amazing victory for the broad swath of Cincinnati streetcar supporters, who had turned out by the hundreds to gather many thousands of signatures on the referendum petition. It’s also recognized as a huge victory for rail advocacy and for urban livability, and a terrific model for communities throughout North America. Simulation of Atlanta’s Peachtree St. streetcar. Graphic: Railway Preservation. Atlanta, Georgia — Completion of Atlanta’s streetcar project (called a “loop” because, to provide two-way service, it consists of single-direction lines running on roughly parallel streets that form elongated loops) is just about six months away from its scheduled opening in the spring of 2014, according to an Oct. 14th report in the Atlanta Curbed blog. As Urban Rail Today reported in the earlier article Atlanta Streetcar construction pushes forward (25 February 2013), the total route of the streetcar starter line is 2.62 miles, with a project cost of about $93 million. It would re-install a tiny fragment of the urban area’s once-extensive network of nearly two dozen urban and several interurban surface electric railway lines, the last of which was scrapped in 1949. Streetcar trackage under construction in Ellis St., summer 2013. Photo: Central Atlanta Progress. Looking to the future … the new modern streetcar line, designed to carry passengers between Centennial Olympic Park and the King Historic District, has 12 station-stops, with headways projected to be 15 minutes between trains. Ridership is projected at 2,600 per weekday. According to the project’s executive director, Tim Borchers, construction is now on time (overcoming earlier delays) and $2 million under budget.